Two episodes in and a pattern is already forming. 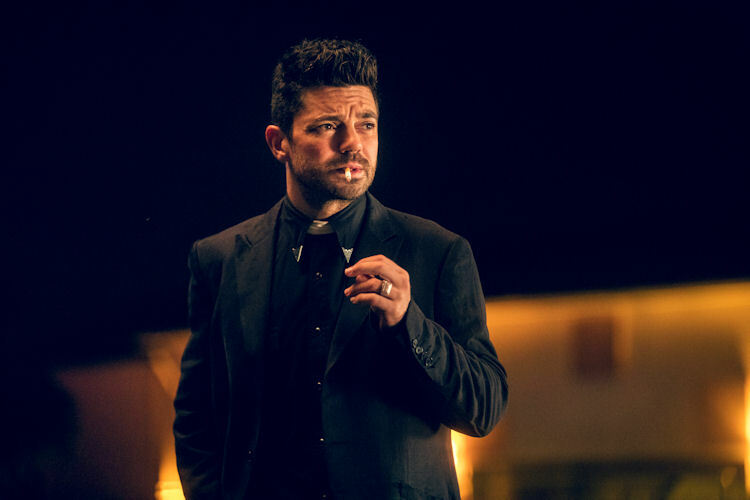 Instead of embracing the slow burn like so many other AMC shows, Preacher plants a story seed in one episode so you can see it blossom in the next. Such is the story of Fiore, the angel who sent the Saint of Killers after Jesse, Tulip and Cassidy in the first place. He appeared in a news report and in the background as “The Amazing Ganesh” in the season premiere. 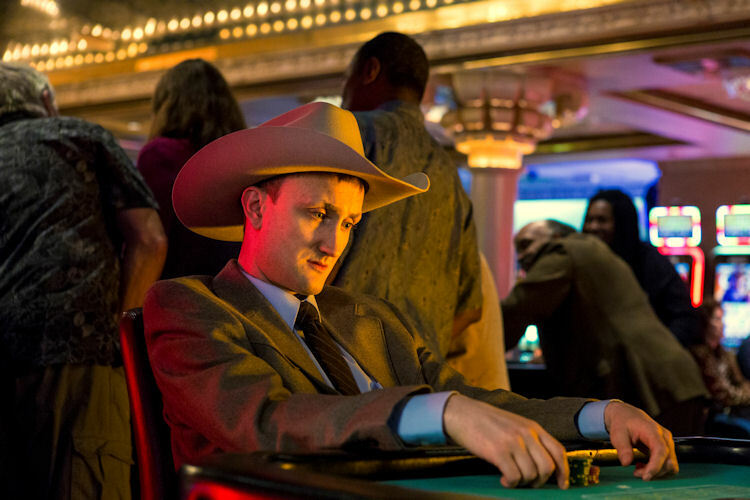 Once Cassidy remembers his importance, the intrepid trio head to the casino resort where Fiore has set up shop. 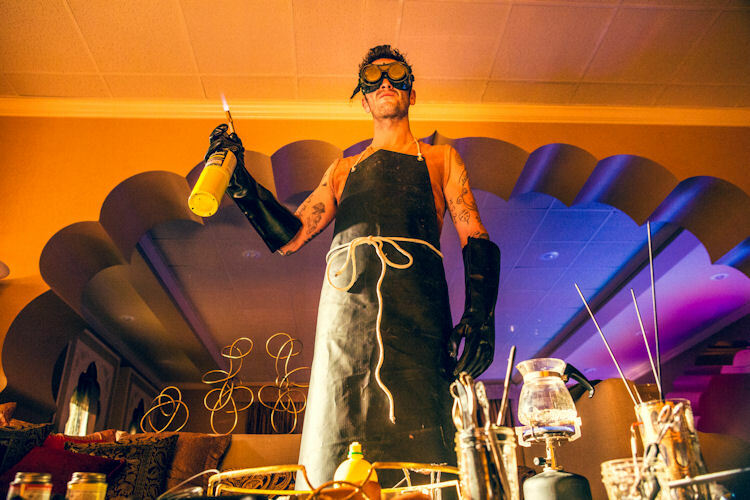 Of course the show had to tie up that loose end of the Saint having the drop on Jesse in front of the hotel hosting the gun-nut convention. Thanks to the intervention of fate (something we should all be keeping tabs on), the Saint’s bullet doesn’t hit Jesse. Instead a delivery van pulls in font, the driver takes the bullet and the truck wheels, pulls and hard turns, smack into the Saint. The shots and the crash attract a sizable contingent of well-armed hotel guests who (with a little help from a Genesis command) open fire on the Saint. Their best efforts do zero good and only serve to anger the Saint. During the commotion, Tulip has turned on the TV and caught up with events; Annville has turned into a mushroom cloud of cow farts. 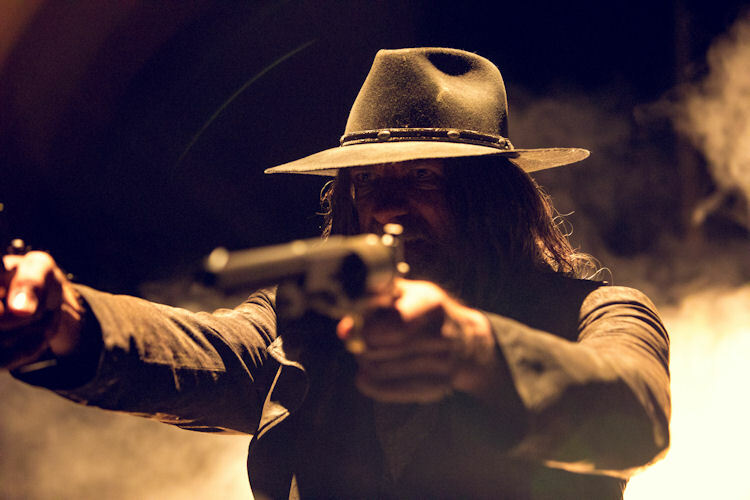 It stops everyone in their tracks for a second, but the wrath of the Saint of Killers waits for no man – plus the TV blows up. The trio make their escape and head down the road to the casino, as we catch up on what the angel Fiore has been up to the past few days. Fiore, too, ends up at the casino spending his days around the hotel and his nights killing himself, only to be reborn instantly. One suicide was public during the house lounge act, and his reincarnation drew a standing ovation. Thus, the Amazing Ganesh was born and Fiore kills himself in exotic ways, much to the delight of the growing poncho wearing crowds that see him as a sort of Gallagher of Gore. Cassidy and Jesse’s meeting does not go well. Fiore gives up all he knows about the Saint, including the fact he hired him. In trying to make up for the Tammy incident, Cassidy offers to work on Fiore for a little under three hours (a process that involves vast amount of drugs and Archie comics). Tulip is bummed by the fate of Annville because her last surviving family member, her drunk uncle from Season 1, was in town at the time. She realized the man was a bundle of flaws, but on a special day from her childhood he put on a suit for her, which made her feel special, and she never forgot it. It’s one of the few positive pieces Tulip has about her past, which is checkered to say the least. In the afterglow of another hotel room romp, Jesse proposes marriage to Tulip … because he saw a chapel in the lobby. She resists at first, then decides to go for it. While they are waiting, the next story seed arrives in the form Gary, a monstrous mobster from Tulip’s past who works for Victor, their mutual bossman. 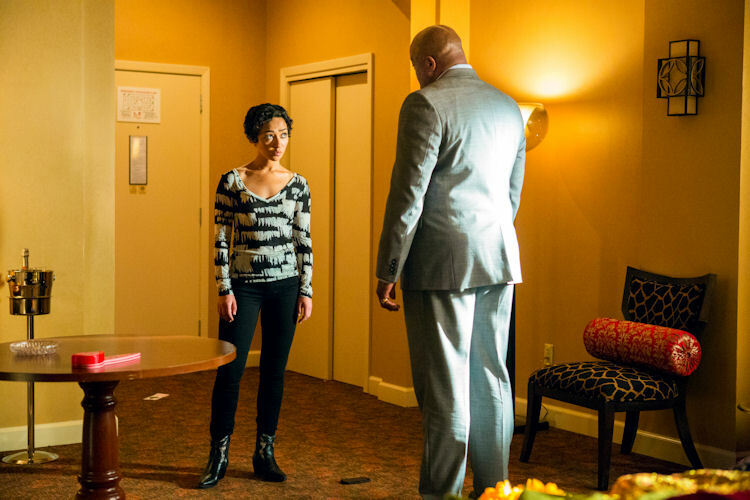 Tulip slips away from Jesse to pursue Gary, and they eventually meet in Tulip’s room. Victor has been looking hard for Tulip, and Gary says she should call him. Tulip wants no part of Victor and knocks the phone out of Gary’s hand, eventually picking a fight with the man twice her size. Tulip gives as good as she gets, and eventually smashes Gary’s face into a wall just as Cassidy strolls in from his drug binge with Fiore. Tulip now needs Cassidy’s help getting rid of the body, and to keep this encounter secret from Jesse (that’s two secrets Cassidy and Tulip are keeping from Jesse; it feels like this running tally will be important). While Jesse is waiting he has an epiphany on where their search for God should go next. If God is a fan of jazz, then New Orleans should be a logical landing spot. When the trio regroups, Tulip begs off getting married, and manages not to throw up when she learns that the Big Easy is their next destination (it appears to be prime Victor territory). The trio say their good-byes to Fiore, despite his refusal to call off the Saint, who later appears in Fiore’s dressing room. Fiore re-confirms the job, the Saint’s prize – seeing his family again – and adds another name for the Saint to kill. Despite Cassidy exposing Fiore to a whole new side of immortal life, Fiore just can’t carry on and asks the Saint to end his misery. So during a performance, the Saint shoots Fiore from the back of the house and Fiore’s corpse gets booed when he doesn’t resurrect. Once again the plot and the road trip keeps moving, as the main characters don’t stay in one place for very long. New Orleans might change that formula up a bit, as there seems to be a fair amount of intrigue awaiting everyone there. The second season is off to a good start and should only get better as its plot garden grows. 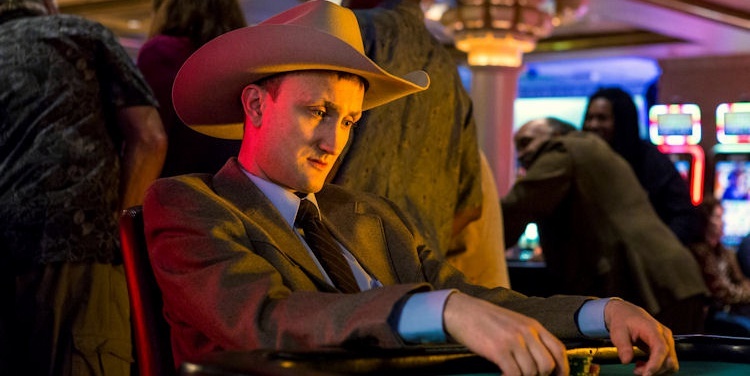 Comic callback ***Spoiler***: Did you catch the quick shot of Jesse in thought with an aquarium tank behind him? A tiny treasure box opened and closed, reminding him of his nightmarish childhood. Raised under his nasty grandmother’s (Marie L’Angelle) evil eye, Jesse was often punished by being locked in a weighted box (coffin), and submerged in a river. Tags: AMCArchieArchie comicsCassidyDominic CooperEvan GoldbergFioreGraham McTavishJesse aquariumJesse coffinJesse comics locked in boxJesse CusterJesse Custer aquariumJesse Custer childhoodJesse Custer coffinJesse Custer fish tankJesse Custer grandmaJesse locked in a boxJesse's grandmaJoseph GilgunMarie L'AngelleMumbai Sky TowerPreacherPreacher easter eggPreacher Episode 2Preacher Episode 2 reviewPreacher fish tankPreacher fish tank scenePreacher Mumbai Sky Tower ReviewPreacher reviewPreacher S2 E2Ruth NeggaSaint of KillersSeth RogenThe Saint of KillersTom BrookeTulip O'HareWhat was important about the aquarium in this week's Preacher?